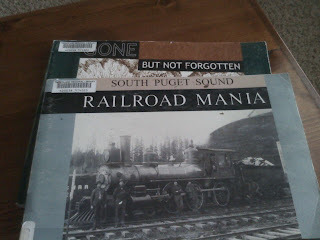 I was looking for a particular piece of history that I couldn't easily find online, so I quickly checked out every book at the Olympia Timberland Library that had any relevance at all to railroads in Thurston County. 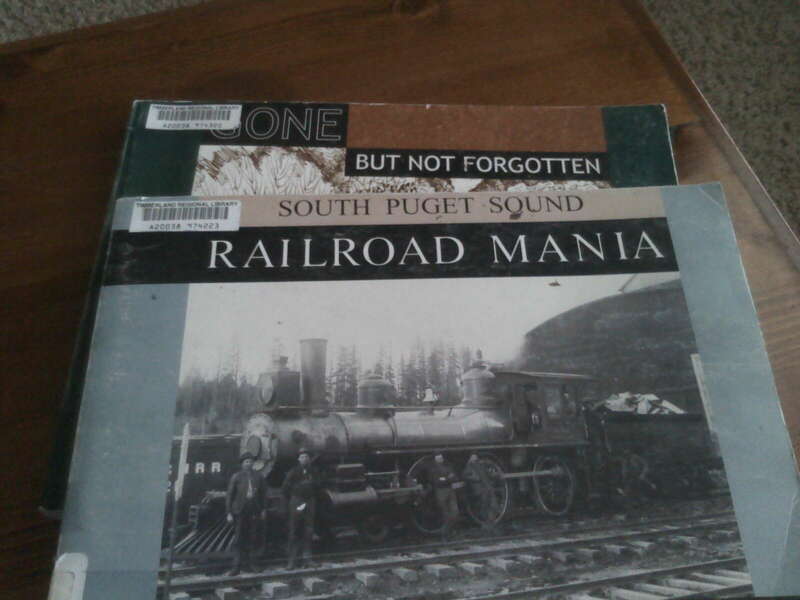 Two of them -- South Puget Sound Railroad Mania (a goofy name for a great book) and Gone But Not Forgotten: Abandoned Railroads of Thurston County, Washington -- are insanely good books. I'm pretty sure I'd brought home the first book before at some point, but I don't think I gave it enough time to really realize how good it was. In a lot of ways, the story of the South Sound can be told through transportation and by railroads. The dozens and dozens of timberland railroads explored by both books show how we really did interact with our landscape in a much different fashion in the past. Each small railroad was a different timber operator in a different corner of the region. Instead of residential homes on 5 and 10 acre parcels and hobby farms, we had a semi-industrialized, narrow gauge sort of world. I was mostly interested in the lines that used to and still do cross Olympia. Going through the books over the weekend, I found downtown Olympia at one point had three different railroad stations. Anyone that has seen the famous Olympia birds eye view knows that a railroad used to go down the west side of what is now Capitol Lake. Where 4th Avenue crosses that old railroad, there was a railroad station. Most folks could also guess that the old white building between the railroad tracks and Columbia, down by Amanda Smith Way, was also a railroad station. Most surprising to me, but now sort of obvious now that I realized how close it was to an existing railway line, but the Olympic Outfitters building used to be a railroad station for the Northern Union (thanks Andrew!) Pacific. The main line ran down Jefferson St. (as it does now) to the port, but a couple of lines diverged at Jefferson and 7th, ran in the middle of the block and ended at the station. Olympic Outfitters was a Union Pacific station and the site of the famous runaway train. Couldn't find a thing on the old depot yesterday, now tons of stuff.